The week of 11 May, 2015, a small contingent visited 3 schools. 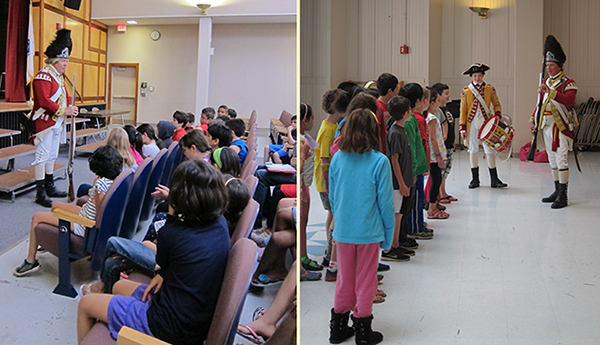 Eric Niehaus, Paul Dooley and Rob Lee visited St Raphael's School In Medford, MA. 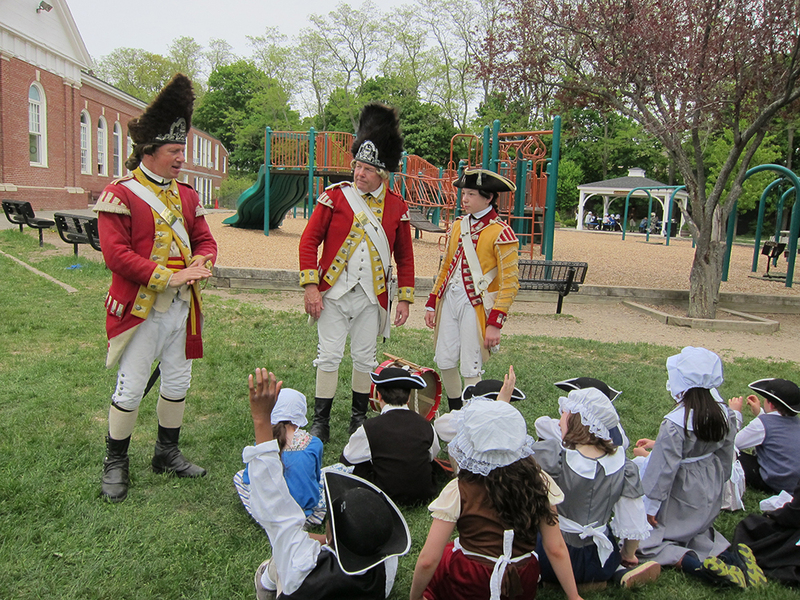 We Spent 90 Minutes with 30 Students in period dress at their Colonial Day. Included were a very impressive traveling museum, excellent questions and spirited marching and drilling. Special Thanks to Linda Franzack for hosting us! Friday, May 15: A great day! Alexei Kraytman, Paul Kraytman, Eric Niehaus and Rob Lee visited two schools: The Hosmer School in Watertown and the Burbank School in Belmont. In Watertown, our 4th year visiting, we met with 80 students and instructed them in marching and drilling and entertained many excellent questions. Thanks to Susan Monfette for hosting. We stopped for coffee at the Town Diner and met Light Infantry Alum RODNEY FERNALD ca 1973...he sends his best. The Burbank School Colonial Day started with food...really good food... Beef Stew, Chicken Pie, Roasted vegetables, snickerdoodles and cider. A photo of the 10th was prominently displayed on the Colonial History timeline. We met with 6 groups of about dozen kids throughout the afternoon, touching on topics from taxes to wigs, marching outdoors. This is a really fantastic Colonial Day. Thanks to Lisa O'Sullivan for having us. PHOTOS by and thanks to Paul Kraytman. ALL 3 schools have invited us back for next year! Studying the American Revolution in school? Having a Parade or Town Celebration? Add some history and color to your event by having the Tenth Regiment appear. 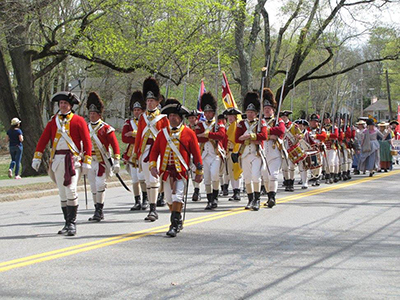 His Majesty's Tenth Regiment of Foot marching in the 2017 Patriot's Day Parade in Lexington, MA with Colours waving and bayonets fixed. Members of the Tenth Regiment routinely make visits to schools to provide an interactive program explaining the British soldier's point of view. The Regiment marches in Parades and participates in other activies associated with local celebrations. We also have appeared in various documentary films and even added a little color to a few weddings. 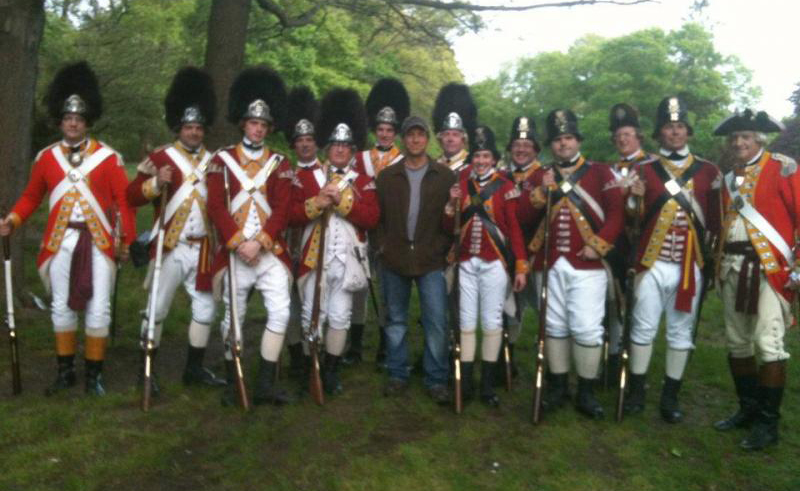 In 2012, the Tenth Regiment helped Mike Rowe film "How Booze Built America" for the Discovery Channel. If interested, simply contact us to make arrangements. Generally, for school visits, we need at least a one month advance notice. Please contact Serjeant Rob Lee for more information. For Parades, Municipal Celebrations and other appearances, we need to know by February to get your event on our schedule. Please contact our Adjutant Major Michael V. Graves. Even if you still are planning your event and it is after February, please contact Major Graves to check our availability. In 2014, Cpl. 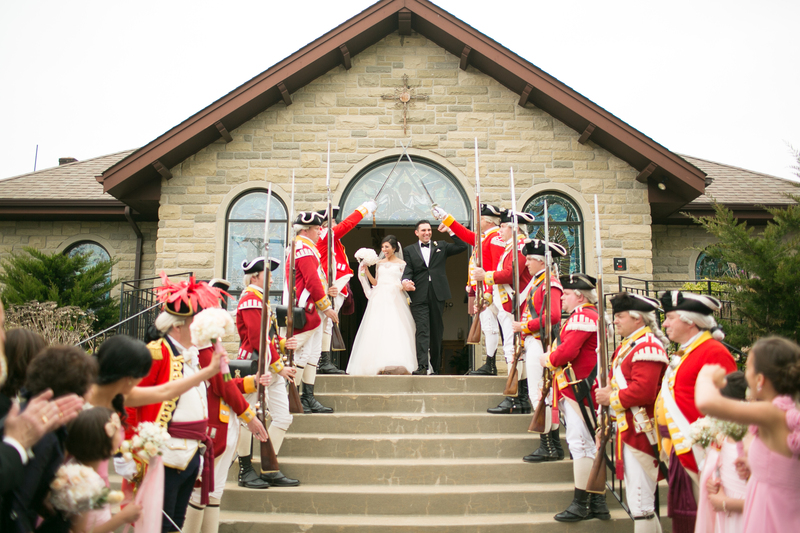 Gonzalez of the Grenadier Company was married, complete with a full Regimental parade outside of the church. Cpl. Niehaus and Colonel O'Shaughnessy pose with a potential recruit at the 2015 New England Camera Club Council Photo Conference, Amherst, MA. 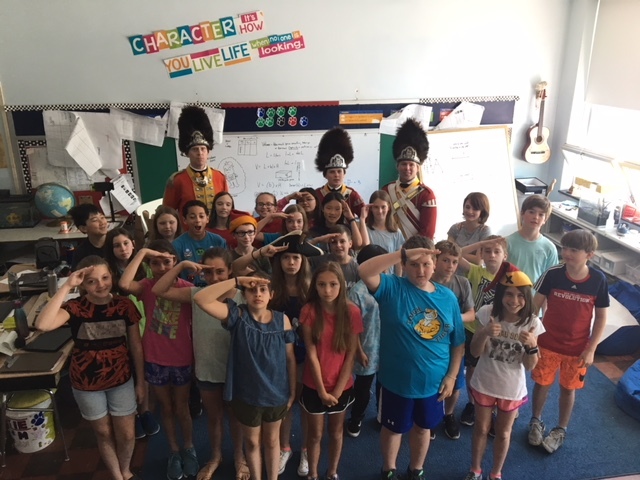 May 2018, Captain Meriwether and Pvts Connelly and Meriwether from the Grenadier Company visit the Barrington Middle School in Barrington, RI. What does it cost? School visits are part of our educational mission and therefore are free, although we always are willing to accept donations to cover the costs of these programs. For Parades, we do charge a fee, but for this, you get the entire Regiment, Grenadiers, Light Infantry, Music, our Colours, and our Corps of Civilian Volunteers. Fees for other events may be negotiated depending upon the size and scope of your event.